FRIDAY NIGHT LIGHTS (FNL), with over 11,000 particpants, is the Largest NON-PROFIT Youth Flag Football League in the United States. 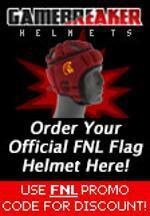 FNL started in Los Alamitos, CA in 2006 with 300 participants and has grown to over 11,000 participants competing in both a Fall and Spring Season. Expansion has taken the league to 7 locations: Huntington Beach, Murrieta, Temecula, Newport Beach/Costa Mesa, Carlsbad and now.....the Great City of Garden Grove. Fall Registration begins online May 1st and Spring League registration begins Nov. 1st.